Before taking that elevator ride up to the Skydeck, the bus stopped over for a few minutes at the United Center so that we could take some photos. 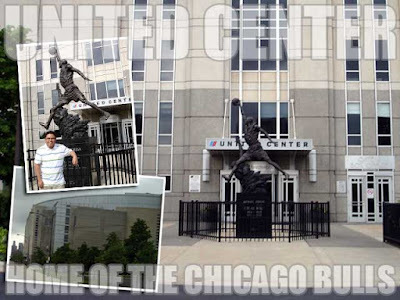 The United Center is the home of the Chicago Bulls. Outside is a statue of "His Airness" Michael Jordan, the team's legendary guard who lead the Bulls to six NBA championships. By acclamation, he is said to be the greatest basketball player of all time! It was a surprise though seeing the statue there when Michael Jordan is very much alive and kicking. After Sears Tower, we also dropped by Navy Pier for lunch. This is another heritage structure that was adaptively reused and converted into a shopping and entertainment complex. 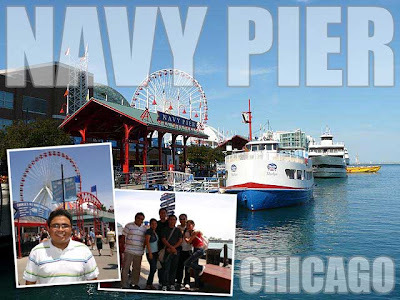 If you plan to hop on the Architecture Cruise or cruises to Lake Michigan, Navy Pier is where you can find them. 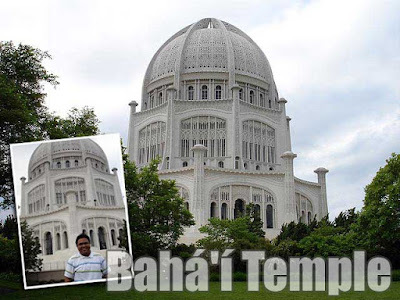 We also dropped by the Bahá'í House of Worship in nearby Wilmette, one of the lakefront suburbs of Chicago. It's the temple of the Bahá'í Faith, a religion founded by Bahá'u'lláh in nineteenth-century Persia. Plans to construct this temple began in 1903. Construction commenced in 1921 and was finally completed in 1953. For the evening, we had a picnic in Grant Park while enjoying the 25th Annual Chicago Blues Festival. But I didn't stay long since I had to meet up with my family who were on vacation in Chicago as well. So I took a Metra (the transportation system from Chicago to its suburbs) to Lisle where my family was staying. It was a coincidence that my mom had a mini-reunion with her US-based high school classmates in Chicago, and an even bigger coincidence that the dates matched with my Chicago trip. So at least I got to meet up with them even just for a few hours since they were leaving the next day. 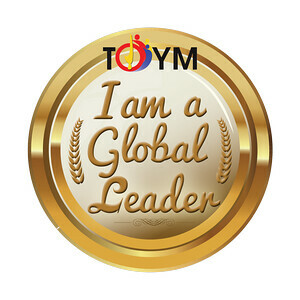 yehey! chicago photos!!! :D asan na sina docry, patrik, ivan? glad you are having fun. huhu, naalala ko ang baha'i temple photos ko, all gone when i lost my camera. howel. reason to come back. 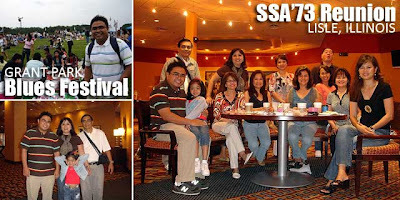 ang saya, anjan din family mo! You guys should have gone on the SeaDog Architectural Tour or speedboat ride! Those are fun and entertaining!